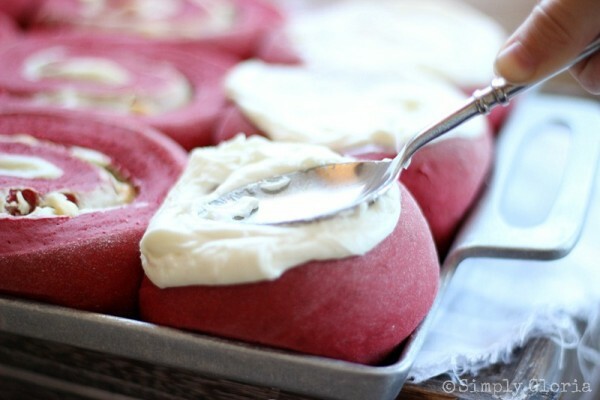 Swirling tender Red Velvet Sweet Rolls circling around a cream cheese filling and capped with a mound of white chocolate cream cheese icing! 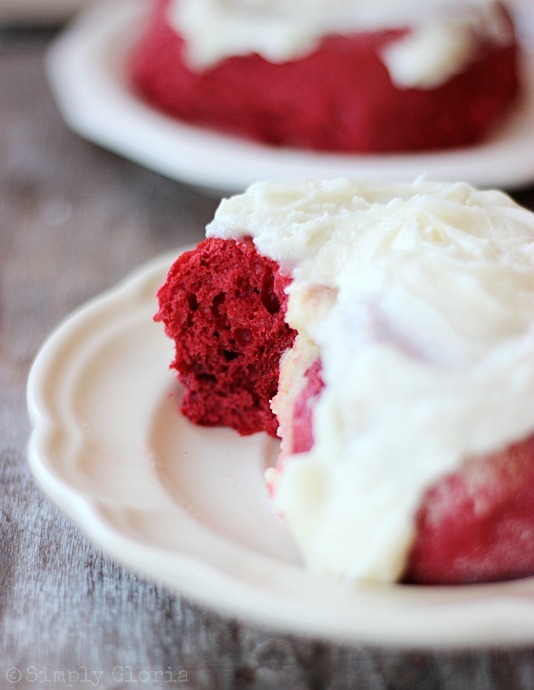 It is a Red Velvet kind of day, my friends! 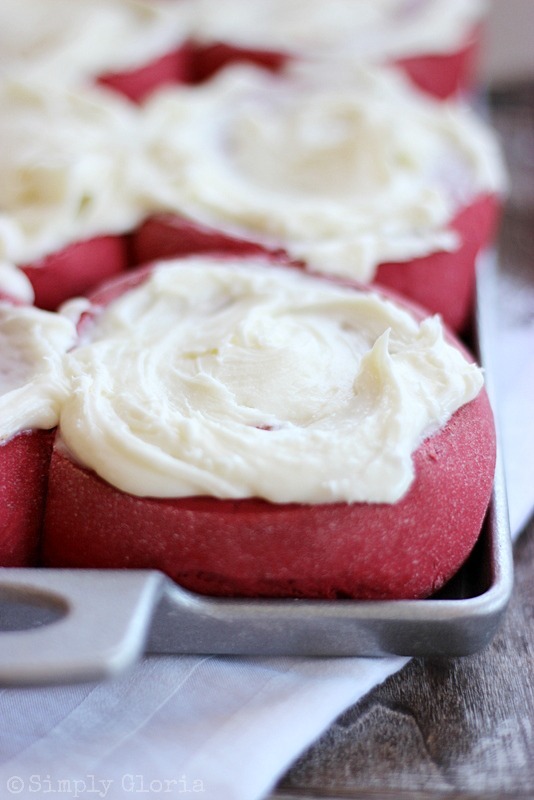 In fact, a Red Velvet Sweet Roll kind of day! 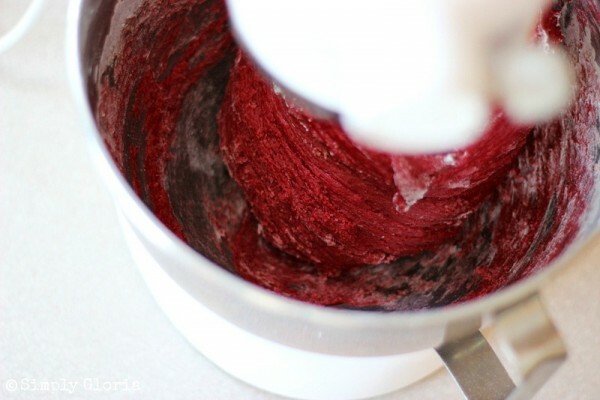 The deep red dough has the makings of what you’d expect when you hear of Red Velvet– cocoa powder, buttermilk, and red coloring. The texture will just melt in your mouth! 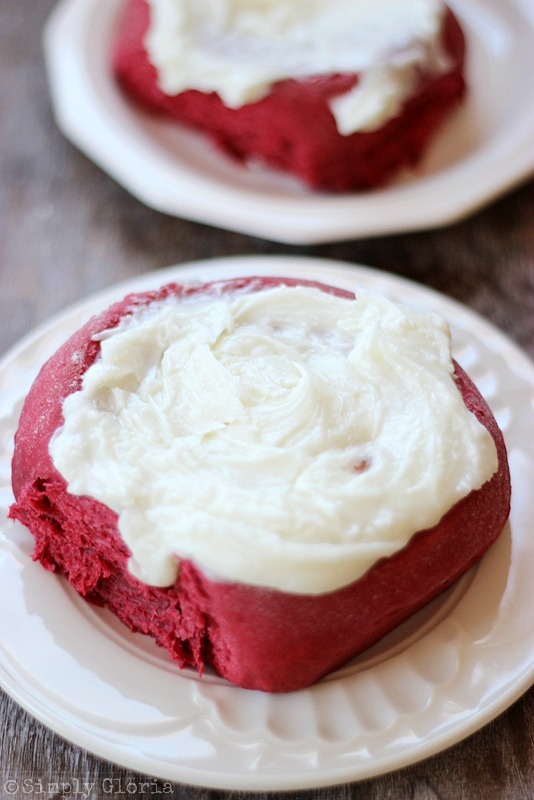 Inside of the red velvet swirls is a cream cheese filling with sprinkles of white chocolate chips. 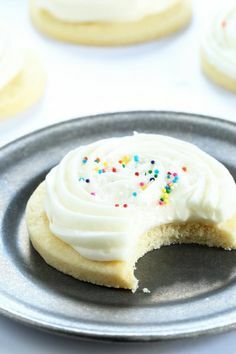 The icing is made up of more sweetened cream cheese and melted white chocolate. These babies have been through quite the process to get where they are now. Testing, testing, and even more testing. Until the recipe is what I expect and envisioned. When I start developing a recipe, especially this particular one, ALL of the components have to be perfect. The texture, taste, and the color. Especially in this recipe. I am very comfortable with making breads and dealing with yeast recipes. In fact, I grew up knowing how to make fresh loaves of bread on a daily basis. If you haven’t tried a recipe yet with yeast being involved or anything like this before, please don’t be intimidated. I am going to give you step by step instructions and show you through the way. You will find it easier than you’d ever expect it! Even after all of these years of making different kinds of breads with yeast and different flours… I still do the happy dance! When I see how the dough has risen and how it has all come together after it’s been baked! And, you will be doing the happy dance, too! Then gather all of your ingredients together. Start with scalding the whole milk. Add butter to the scalded milk. Stir in the red food dye after the butter has melted. Set aside. The milk mixture will start to cool a bit while you get the rest of the ingredients prepared. 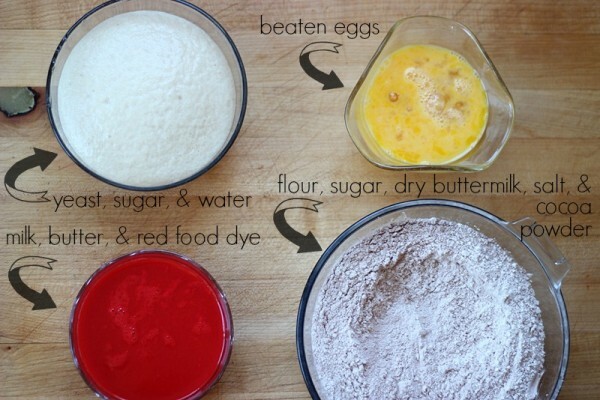 Put the yeast, sugar, and water together in one separate bowl. Set aside in a non drafty spot for 10 minutes. I’ve mentioned before, I like to place the yeast (and the dough) inside of the (turned off) microwave with hot water beside it. Beat the eggs in another separate bowl and set aside. Best if your eggs are room temperature. In a large mixing bowl, whisk together the dry ingredients: flour, sugar, dry buttermilk, salt, and cocoa powder. Only add 3 cups of the 4 1/2 cups of bread flour at first. You will be adding the rest of the flour in later. Make a hole in the middle of the flour mixture. Add the yeast mixture that has doubled in size and is all foamy. Along with the red milk mixture and the beaten eggs. Use a dough hook if you have a standing mixer and mix on low speed. Otherwise, use a large wooden spoon to mix the dough. After all the ingredients are mixing together, slowly add the rest of the flour. (Depending on your elevation, you may or may not need to use all of the flour that is listed in the recipe. When you get to the last 1/2 cup of flour, sprinkle 1 tablespoon at a time.) When it starts to pull away from the sides of the bowl, the dough is done. Take the dough out onto a lightly floured surface. Sprinkle with a little bit of flour on the top and knead together for one more minute, forming it into a round shape. Cover the ball of dough for about 10 minutes. I usually tip the bowl upside down to cover the dough. By letting the dough rest, it is forming elasticity. Which will be easy for you to roll out. While the dough is resting, time to get your cream cheese filling ready. In a medium size mixing bowl, add the softened cream cheese, sugar, egg yolk, and vanilla. Mix until all combined and set aside. Roll out the dough on the slightly floured surface to an oblong shape and about 3/4 inch thick. It does not have to be perfect …that’s what baking from scratch is all about! 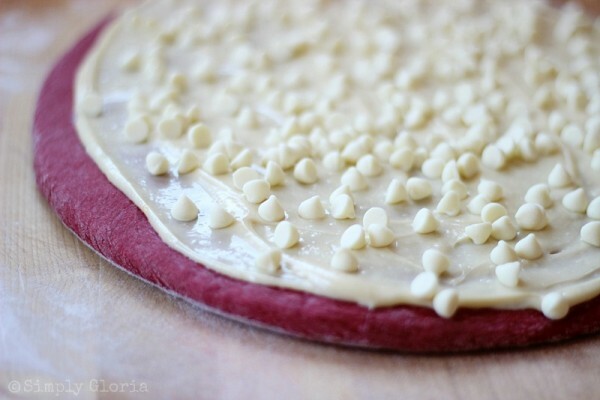 Once you have rolled the dough out, spread on the cream cheese filling and sprinkle on the white chocolate chips. Start on one end of the long side, and start rolling. Have the end piece tucked underneath. Gently mark the top of the roll with something with a straight edge to mark where you are going to cut. This makes about 12 pieces if you mark them about 1 3/4 inches apart from each other. Just note, this varies how many you’ll have on how you rolled it out. But my average always comes out to about a dozen pieces. Hold a piece of long thread with both hands. Slide it underneath the roll and crisscross the thread on top while going down onto the dough. It will cut without smashing the dough. Place the cut sweet rolls carefully onto a greased (or covered) baking sheet about a half inch apart. Let these rest for about 10 minutes in a draft free zone… a.k.a. the microwave! No need to cover them with any plastic for those 10 minutes. Heat up your oven to 350 degrees while they are doing their thing (in the microwave). Since every oven is different, and they are, bake for about 30-35 minutes. When it gets to be about half way into the baking process, you may want to check the tops where the white chocolate chips are showing. If they are starting to brown, lightly cover with a piece of aluminum foil. 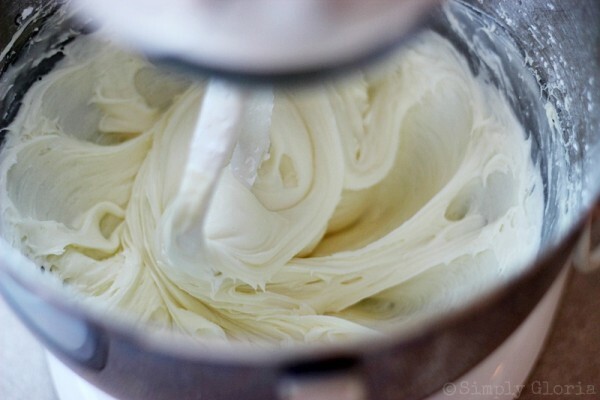 While the sweet rolls are baking, start making the White Chocolate Cream Cheese Icing. Whip the softened cream cheese and vanilla. Add one cup at a time of confectioners powdered sugar, while intermittently adding one tablespoon at a time of heavy whipping cream. Scrape down the sides of the mixing bowl and whip for 2 minutes. Slowly drizzle the melted white chocolate into the icing while it is whipping. As you pull out the sweet rolls of the oven, allow them to cool for about 10 minutes before you frost them. My little Easton is such a big helper with the icing! Smother them all with the creamy white chocolate icing…. 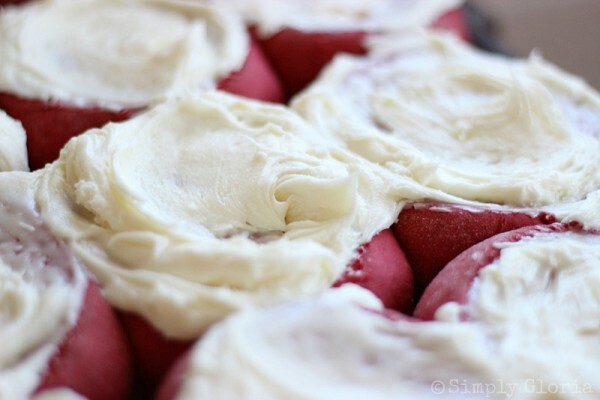 Swirling tender Red Velvet Sweet Rolls circling around a cream cheese filling and capped with a mound of white chocolate cream cheese icing! Makes 1 dozen. Tightly cover or store in an air tight container.. Stays fresh for up to 3 days. Scald the whole milk. Add butter to the scalded milk. Stir in the red food dye after the butter has melted. Set aside. The milk mixture will cool while you get the rest of the ingredients prepared. 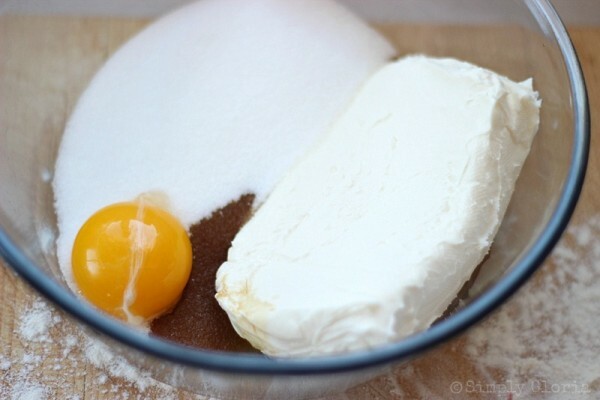 Put the yeast, sugar, and water together in one separate bowl. Set aside in a non drafty spot for 10 minutes. Beat the eggs in another separate bowl and set aside. In a large mixing bowl, whisk together the dry ingredients: flour, sugar, dry buttermilk, salt, and cocoa powder. Only add 3 cups of the 4 1/2 cups of bread flour at first. Add the rest of the flour later. Make a hole in the middle of the flour mixture. Add the proofed (foam) yeast mixture, the red milk mixture and the beaten eggs to the hole in the flour. Cover the ball of dough for about 10 minutes. I usually tip the bowl upside down to cover the dough. 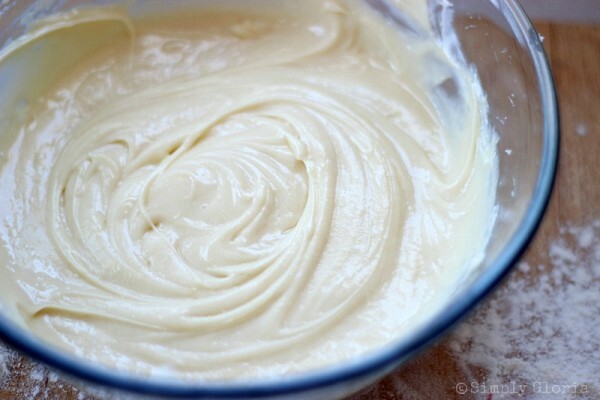 While the dough is resting, add the softened cream cheese, sugar, egg yolk, and vanilla to a medium size mixing bowl. 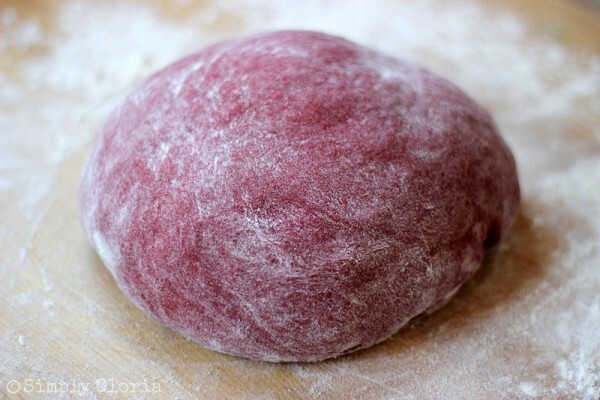 Roll out the dough on the slightly floured surface to an oblong shape and about 3/4 inch thick. Spread on the cream cheese filling and sprinkle on the white chocolate chips from 1/4 inch from the edges. Start on one end of the long side, and start rolling. Be sure to have the end piece tucked underneath. Gently mark the top of the roll with something with a straight edge to mark where you are going to cut. This make about 12 pieces if you mark them about 1 3/4 inches apart from each other. Hold a piece of long thread with both hands. Slide it underneath the roll and crisscross the thread while going down onto the dough. It will cut without smashing the dough. Let these rest for about 10 minutes in a draft free area, uncovered. Bake in a preheated 350 degrees oven for 30-35 minutes. Melt the white chocolate chips over a double boil. Cover the warm sweet rolls with the icing and serve. Size may vary with how the dough is rolled out. When it gets to be about half way into the baking process, you may want to check the tops where the white chocolate chips are showing. If they are starting to brown, lightly cover with a piece of aluminum foil. Grab a plate and dive right in! Be sure to go over and enter to win the Gourmet Griddle I’m giving away! 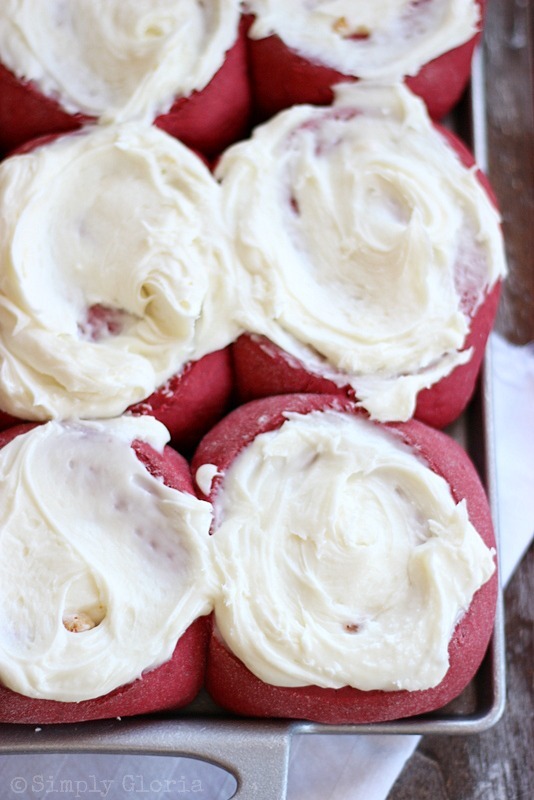 I used mine to bake these Red Velvet babies up! 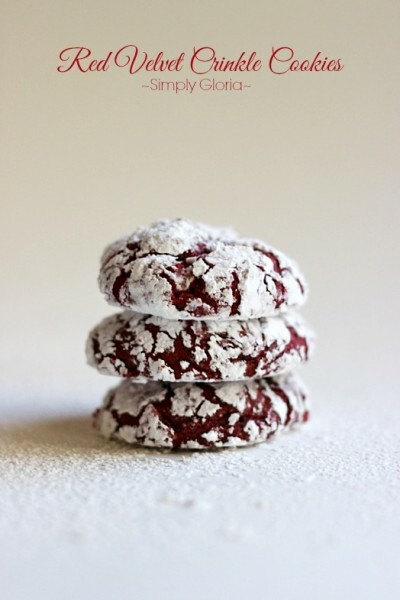 For another red velvet recipe, try these cookies! 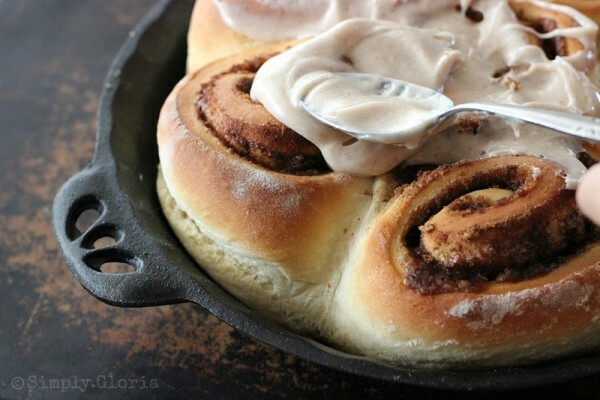 For another kind of sweet roll… with cinnamon, try these! So pretty! And perfect for Valentine’s Day! Have a wonderful week, Gloria! Thank you, Ashley… you, as well! HOLY COW!!!! You’ve done it again!! omg, I love this, pinning to my Red Velvet baord, I know, secretly, you made these just for me to pin to that board! You did a great job with this very thorough tutorial Gloria! And these sweet rolls look out of this world amazing!! I am such a sucker for anything Red Velvet. Especially when cream cheese is involved!! Beautiful job! Pinned!! I am that way too, with RV! I’m happy you like the tutorial. Thank you, Renee! Thank you, Eric! These ARE perfect for Vday! Gloria, these are so pretty and look delicious! Another red velvet recipe that my daughter is going to add to her list – she’s standing right behind and said so! 🙂 Have a happy Tuesday! Cindy, your daughter will love these… especially if she’s a huge RV fan! Hugs! These are so beautiful, Gloria, and they look so soft, fluffy! That creamy filling and frosting is the icing on the already perfect sweet roll! Kelly, I’m glad you like the step by step photos! Having these for breakfast on Vday is a great idea! Oh my goodness! I wish I could reach through the screen for one of those! WOW! Such an original idea. I have mostly been “scared of the yeast” but I may take the plunge and give the a try. Perfect for Valentine’s day! Thank you for sharing! Donna, you’ll find out after trying the whole yeasty thing that you’ll probably be in love with it. And, realize how simple it can be! Let me know if you try the regular cinnamon rolls or these! 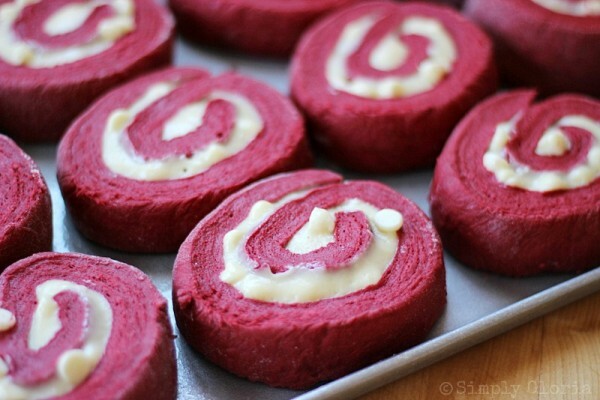 Oh wow, it IS a red velvet roll day! I haven’t even started Valentine’s Day baking (tomorrow:) Your photos are gorgeous! And you had me at melted white chocolate and cream cheese. Um … yum! Pinned! Mary Frances, gotta love red velvet! Have a most wonderful day today! Gloria the color turned out exquisite! Sounds like a delicious combination, pinning! Thank you so much, Emily! The color was one of the tricky things of developing this recipe. The balance of cocoa powder and red coloring was pretty tricky at first. Have a great day! I was drooling over these on pinterest yesterday and didn’t even know they were yours! Wow they look and sound incredible! And your photos are stunning. The breakdown on how to make these is super helpful. Love it! Aww, thank you so much, Chelsea! I’ll trade you for your RV treat! Pretty much in love with these. 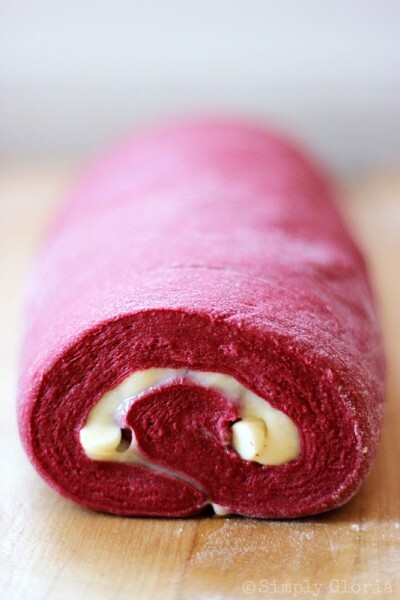 The color, the look, the taste – marry me sweet rolls! Gloria, you did an amazing job on these! What a fun treat to have for Valentine’s morning! The kids won’t know what hit them!! Kids DO love color! They would dig these for a special Vday treat. Hope you’re having a great weekend, Nancy! Really!? Wow, that is all I have too say. You make the best sweet rolls ever, they always look so incredible. The red velvet red in these pictures just pop, loving the pictures! I am convinced that you need to open your own bakery in Utah, even if its from the house. You are too good not too! Krista, so funny you mention about a bakery dilly! I LOVE making cinnamon rolls pretty much weekly. (I actually have some in the oven as I’m writing this to you!) I brought it up to Justin that everyone needs cinnamon rolls in their lives…. and I can bake them up for them! He looked right at me and laughed. Because I’m always saying things like that. I amuse him, lol! I really think you could! Oh my gosh these are beautiful!!! LOVE them so much, and that filling. Gasp! Thank you so much, Dorothy! They are really fun! OMGEEEEE. This look fabulous, Gloria! Can I have a few? 🙂 Pinning and sharing these on social media. Have a great week, Gloria! These look awesome Gloria! Such a pretty shade of red! And all that cream cheese – to die for! Pinned! It was a challenge to nab that color of red with the amount of cocoa… so, thank you, Lindsay! Wow, Gloria, these rolls are absolutely stunning! I can’t get over that gorgeous color, and the filling is to die for! You’re so funny, Tina! I’m the same way with color and holidays to make it more festive with the food. These are so festive and pretty, Gloria! These are just the perfect rolls !! Holy smokes. That’s all…. i’m speechless! I’m here from jaseyscrazydaisy.com. I’ll be sharing with my FB readers and pinning… and making this bad boys for sure!